Fresh from my basket weaving shop is this heavy patriotic flag handwoven Spongeware Pottery Patriotic Flag Centerpiece Basket with a hand-thrown pottery footed base with blue Spongeware paint and a scallop-cut on the bottom. Hand crafted by basketweaving artist Kathleen Becker. The top of the pottery features a heart-shaped patriotic heart emblem. Glazed on both the top and bottom of the footed base. Personally hand-woven by me with #3 round rattan reed in natural, dyed red and dyed blue spokes, and triple-twined up the sides in natural round reed. The multi-colored spokes add a nice decorative detail on the braided rim! Perfect as a center piece or as a serving bowl for chips or buns! As with all finished baskets, a fabric liner is recommended to keep food from the finish. I have lightly stained the pottery bowl fruit basket in an antique medium oak color to mellow the raw weavers and spokes, and have signed and dated the base in permanent marker. A truly stunning piece! 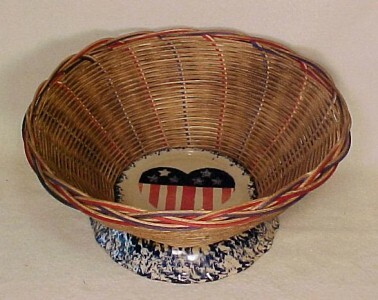 The Spongeware Pottery Patriotic Flag Fruit Bowl Basket measures 11" diameter and 5" high. Approximate weight, 1.25 lbs.